Cecil the Lion: variety of activists have angry tweets decrying lack of attention to non-lion causes in wake of hunting dentist story. 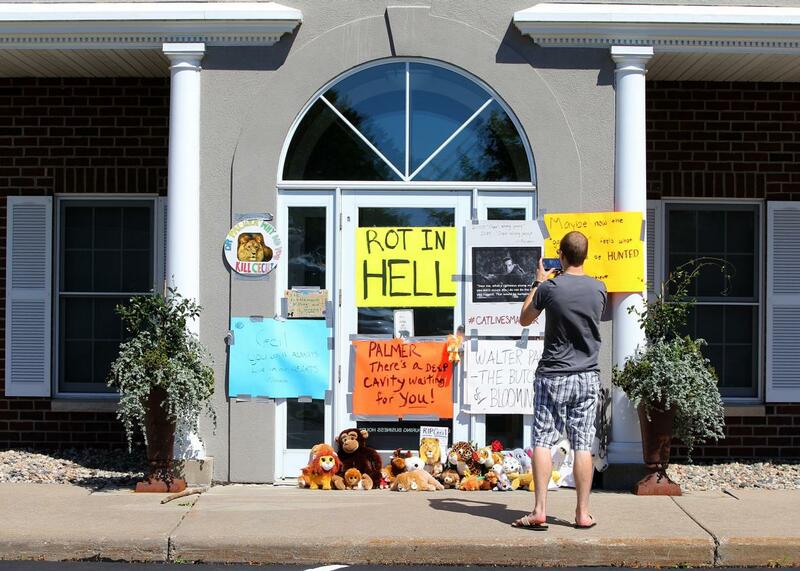 Stuffed animals and angry signs cover the entrance to Dr. Walter Palmer’s shuttered dental clinic on July 29, 2015. The death of Cecil the lion has turned into the hunt for Walter Palmer as the Minnesota dentist revealed as the beloved lion’s killer has gone underground to avoid questions from the U.S. Fish and Wildlife Service and the wrath the collective Internet. The animals in need of attention aren’t all rare. They might just be prepared rare. Florida Senator and 2016 presidential hopeful Marco Rubio had something to say about Cecil and some videos he’s been watching, and there was no shortage of conservatives chiming in with similar thoughts. Look at all this outrage over a dead lion, but where is all the outrage over the planned parenthood dead babies. Tip for reporters trying to figure out why people are shocked by the PP videos. Just pretend PP staff are talking about baby lions. Get it? I get the anger over the dentist and Cecil the lion. I don't get why there's not more anger over the cop and Sandra Bland the person. So, people in Zimbabwe are telling the American press, “black lives matter,” referring to their own lives relative to Cecil. *Correction, July 31, 2015: This post originally misspelled the name of Sam DuBose.